Cheers! This handbag by kate spade new york accessories will add a playful touch to your next look. Perfect to carry iPhone, DL, CC and lip balm. I think I could fit a little more but nothing too bulky. In excellent condition and big enough to hold all if the essentials! Didn't get to use it because none of the 3 dresses I ordered fit so they all went back and the bag never left the house. 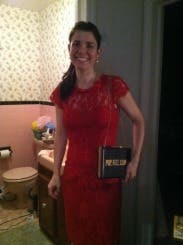 I wore this to a bachelorette party and this purse drew compliments all night long! Large enough to fit a phone, gloss, license and debit cards. You had to make sure the clasp was shut just so or it would pop open. Love that it's rose gold. Matched the rest of my jewelry! This would be perfect for NYE. So cute! Got so many compliments! Fit pretty much everything I needed! 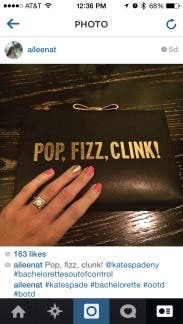 Perfect clutch to celebrate my bachelorette party! This bag was so cute, it was just big enough to hold everything but not overwhelming. The text on the front matched all the champagne I was drinking! I would have loved to have kept this bag! It was the perfect size and the right compliment to my outfit! Super cute one of a kind clutch, but I was disappointed that I could not carry my iPhone and a lipstick and ended up having to have my husband carry my items in his pockets. Cute clutch and great design idea however, the clutch itself is heavy, boxy and awkward. Wouldn't bother to pay for renting this. I agree with other reviewers. Minimal room but I didn't care because the purse was so awesome. It does fit the new iPhone 6plus though! Great bag- I did minimal jewelry because the bag is so great. Only drawback- not very big... Barely held an iPhone, lip gloss and small compact. 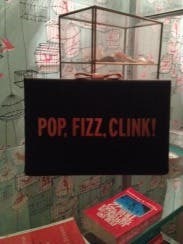 I loved this clutch! It was an attention grabber and a throw back to the Mad Men era to me. It was larger than I expected it to be, but that was not a negative surprise. I would note the hard wear and writing is more rose gold than gold gold. Overall, it was a great addition to my night and I took it to the movies on a Sunday the day after the wedding just because I could. Loved to the purse soo much, it was heart breaking to send it back! Purse seemed brand new, not a scratch. very well made. Loved this bag. I mean LOVED IT! And I am so glad I rented it because I would never, ever buy it. It's so slim I couldn't fit my iPhone and lipgloss in it at the same time. I don't recommend unless your only packing a credit card. This bag will illicit so many compliments! Be prepared! I rented this for a weekend of shopping and going out and by the 2nd day I started counting how many people mentioned the bag...it was in the 20's! It is a stand-out piece and is very appealing with the gold textures and lettering. I used the chain as a shoulder strap which was nice. Also, the clutch is very thin so keys + a phone is difficult to fit! I had to carry my keys in my coat pocket. The best part of this bag is that it can be worn with a killer little black dress and also worn with a crisp white button down and skinny jeans! It's so versatile and again…you'll get noticed because everyone compliments this bag! very cute wore for rehearsal dinner. A thinner purse than i expected. The purse is adorable! The gold bow on the top is perfect and this is great for any event! 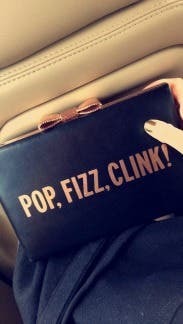 This is the cutest little clutch! I used this at my bachelorette party and we were all obsessed with how cute it is! The gold bow on the top is so cute and its all very Kate Spade! The only downside is that it holds way less than it looks. I basically only had my phone, credit cards, and lip gloss in here because anything wider and the purse wouldn't close. I would definitely recommend this! Everyone ADORED this bag, thought it was too cute, and I loved it too - but it is somewhat narrow. I could barely fit a lipstick and compact in there with my cell phone and credit cards! But since it went so perfectly with the occasion, I'm more than willing to look past that small issue! This is a fun purse and I received many compliments on it. It's a slim bag, I wished it was a little larger. It was difficult to fit more than my phone and a tube of lipgloss in it. Worth noting that the accents are more rose gold than gold. This surprise me based on the item photo but was not an issue for my outfit. 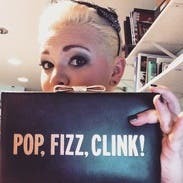 I absolutely loved this clutch! I was so sad to send it back! It was so much fun! 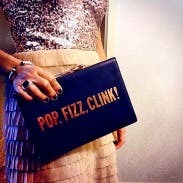 Perfect bag for a party! 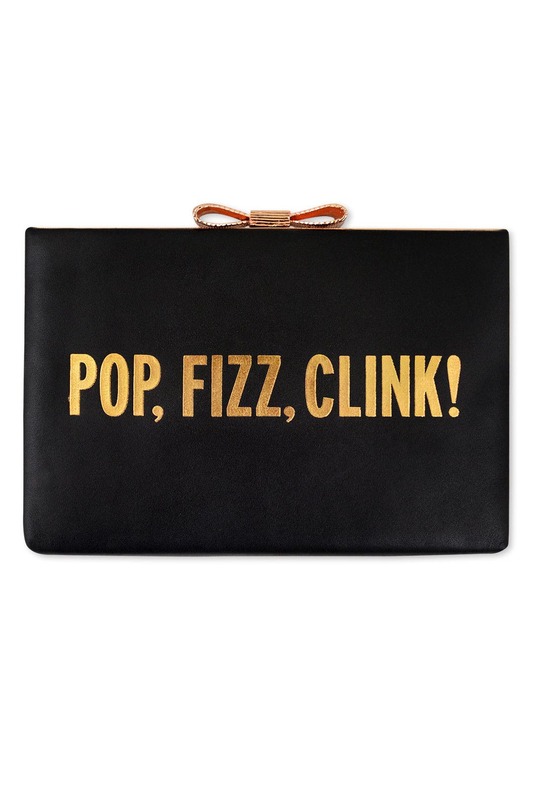 I rented this Kate Spade clutch for my 21st birthday (perfect right?!) and it was awesome! The opening clasp was a bit weird and the bag was very structured, so it didn't hold a lot - but for a party I didn't really need anything more than my phone and some lipstick, so it was perfect! It also has a chain so you can throw it over your shoulder too. Would definately rent again! This bag was a hit! People taking pictures of it with their phone. Great size. You can hold your compact, lipstick, phone, etc with ease. Very charming accessory for an LBD or simpler style dress that needs a pick me up. Great statement piece. Great conversation piece Great to pair with other rose gold jewelry! This clutch is absolutely amazing. So fun. So flirty. Compliments all night. It came slightly damage... Sucked a lil. But I manage to disguise the damage a lil. this is more a rose gold than gold! I couldn't really see that until I got it in person. I happen to see this clutch when I went into the store to pick up my order. I decided to add it on to my order because I thought it would go perfectly with some rose gold shoes that I own. I loved the style of the clutch as well as the size. I was able to carry a lot in there! 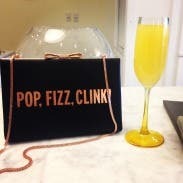 I would buy this clutch and others like it! 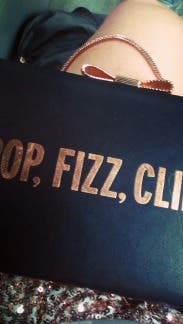 The Pop, the Fizz and the Clink! I have been drooling over this clutch for months! I felt like it was the perfect match for the red Kate Spade dress I rented. I was right! Definitely a perfect bag for a wedding or any fun event. I wish I could keep this bag! 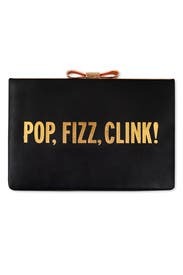 FUN Kate Spade clutch for a FUN party! LOVED all the attention & compliments I've gotten all night! It is a little big, but very slim. A very good size to hold all you need. The compartments inside are very useful, and so is the chain - good length. LOVE the gold bow on top and those big words in gold! Very fun to carry around! 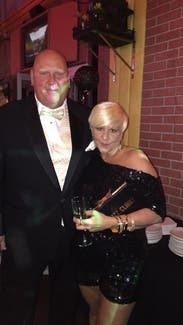 I love your dress! Can you tell me the designer? 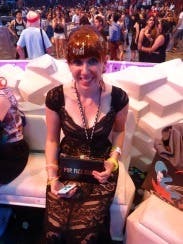 I wore this bag and another RTR dress to the Lady Gaga concert/meet&greet. 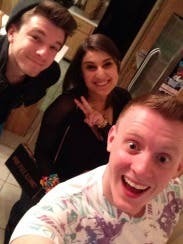 What a night! The bag is exceptionally glamorous! Its deceptively small though, don't expect to carry much beyond your phone, lipstick and cards! I do love that it has built in card holders. 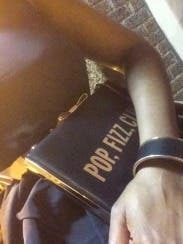 I received sooo many compliments on this clutched and it was so adorable! Would wear it again!